Wheeler Army Airfield is located in Honolulu, Hawaii adjacent to Schofield Barracks. Units stationed at Wheeler include the Defense Information Systems Agency, the 169th Aircraft Control & Warning Squadron of the Hawaii Air National Guard, the 193rd Aviation Regiment and Detachment 55 Operational Support Airlift of the Hawaii Army National Guard and the 25th Infantry Division's Combat Aviation Brigade of the US Army. The US Army Garrison Hawaii provides installation support activities to the units stationed at Wheeler. Due to its role in the Japanese attack on Pearl Harbor, all of Wheeler Airfield was designed as a National Historic Landmark. Aircraft flown at Wheeler include the Boeing AH-64 Apache. 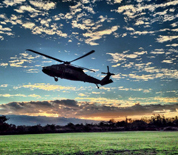 This Wheeler Army Airfield directory features the critical info you’ll need to navigate through the many facilities and recreational opportunities available on base.